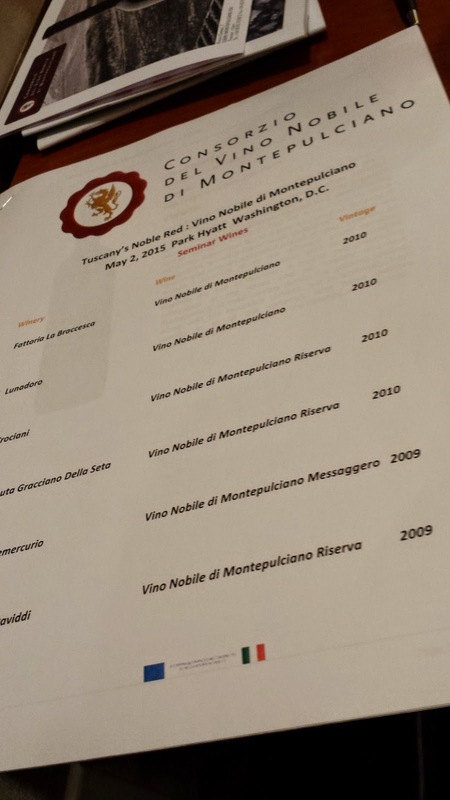 This week, members of the Consorzio del Vino Nobile di Montepulciano came to Washington D.C. as part of a marketing campaign. I was fortunate to able to attend a seminar that provided an overview of the region's wines. The Consorzio is celebrating it's 50th anniversary with their primary goal being to preserve the region's agriculture heritage. The city and region of Montepulciano is located in the larger Valdichiana region within SE Tuscany and borders Umbria to the east. Montepulciano's soil is primarily clay and silt with elevations ranging from 800-2,000 feet. And Montepulciano is considered a Continental climate with long hot and dry summers. In 1980, Vino Nobile di Montepulciano was granted DOCG status with the following rules enforced. The grape vines must be planted within approved viticulture areas close to the town with maximum yields set to 8 tons per hectare. At least 70% of the wine must be Sangiovese, locally called "Prugnolo Gentile"; this specific clone has a thinner skin than its Brunello cousin. The remaining 30% can be a combination of other red grapes approved in the Tuscany region, although up to 5% can be white grapes. There are three types of wines that can be produced in Montepulciano. (1) Rosso di Montepulciano is wine that has been aged in oak for a maximum of one year. These wines are fruit forward and intended to be consumed immediately. 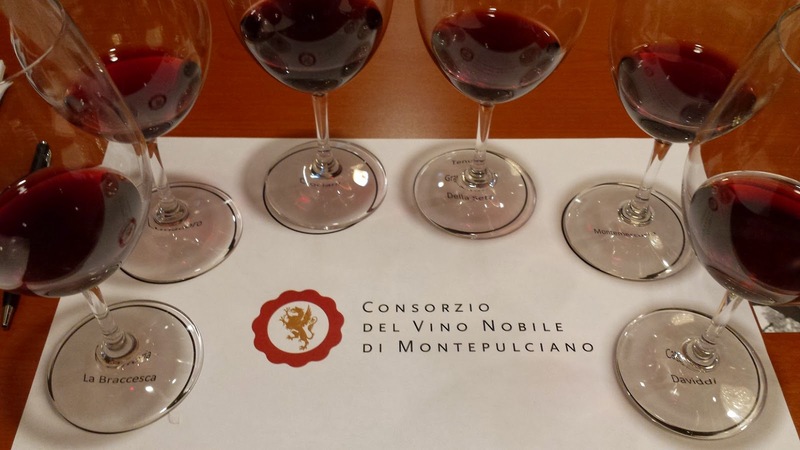 (2) Vino Nobile di Montepulciano is wine that has been aged for a maximum of two years, although there are several permissible combinations of oak maturation and bottle aging. In general, these wines are held back at least one year in the bottle until release. (3) Vino Nobile Reserva is wine aged at least three years, with at least 2.5 years in oak and are usually only produced in very favorable years. Moving to the seminar, there were a few common themes that arose. First, most of the wineries presenting were relatively newcomers to winemaking - having converted family farms from other agricultural or animal husbandry pursuits to vineyards. Second, most of the wines possessed very fruit forward aromas that dissipated as the flavor profile portrayed more earthiness and dust. Merlot was a common addition which may account for the fruity nose. 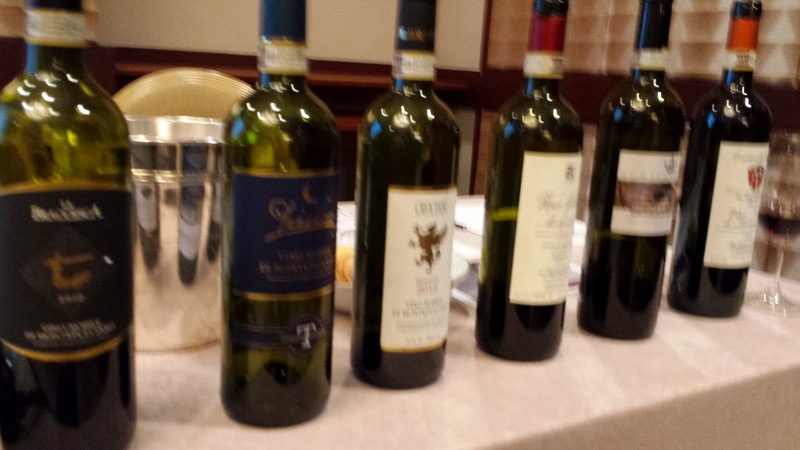 Finally, although Sangiovese is considered an acidic grape, these wines were flatter than I had expected - perhaps due to the blends or bottle aging. The wines we sampled were from 2009 and 2010 with the later considered a perfect growing year with a wet cold winter, slight rain during bud break and flowering, and then a long, hot and dry summer. Fattoria La Braccesca 2010 Vina Nobile di Montepulciano: 90% Prugnolo Gentile and 10% Merlot from the Valiano district and aged one year in oak and one year in the bottle. This wine hit the above mentioned profile, with a cherry fruit aroma followed by a dirty cherry flavor and easy tannins. 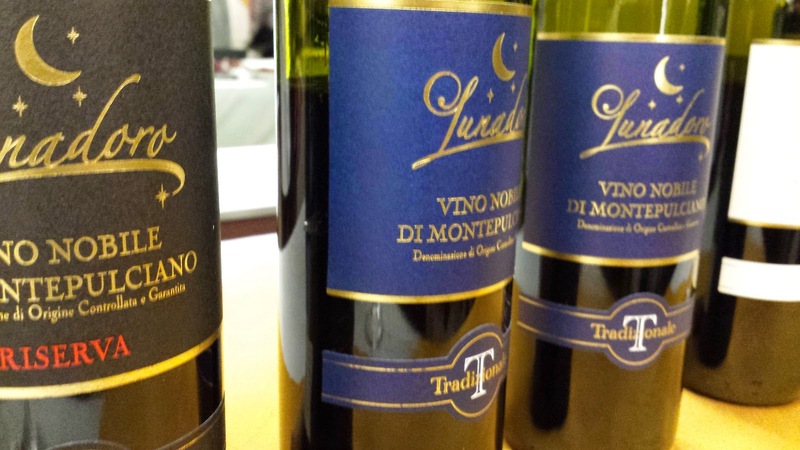 Lunadoro 2010 Vina Nobile di Montepulciano: 100% Prugnolo Gentile from the Valiano district and aged in large Slavonian oak casks for two years. Starts with blackberries then transitions to dirt and lingering smooth tannins. Very nice. Crociani 2010 Vina Nobile di Montepulciano Riserva: made from 80% Prugnolo Gentile, 10% Canaiolo Nero, and 10% Mammolo; fermented using natural yeast, then aged three years in Slavonian oak followed by six months in the bottle. As expected, this is a bigger wine, with less fruit and more dirt. The finish is surprisingly easy and lingers until the next sip. Tenuta Gracciano Della Seta 2010 Vina Nobile di Montepulciano Riserva: made from 90% Prugnolo Gentile, 9% Merlot, and 1% Trebbiano (an example of using a white grape) from the Gracciano district; then aged in various types of oak for three years and then six months in the bottle. The Trebbiano enhances the aromatics, then the wine follows with a leathery profile and finishes smooth. Montemercurio 2009 Vina Nobile di Montepulciano Messaggero (Message of the Gods): made from 95% Prugnolo Gentile and 5% Canaiolo Nero - to strength the body. The wine is then aged for 18 months in Slavonian oak, six months in smaller oak casks, then bottle aged for one year. This wine was somewhat of the exception to the flavor profile with the usual bright cherry fruit, followed by a combination of fruit and dirt in the palette and finishing with strong acids. Perhaps my favorite. Casale Daviddi 2009 Vina Nobile di Montepulciano Riserva: made from 90% Prugnolo Gentile and 10% Canaiolo Nero and aged three years in French oak and six months in the bottle. There is almost a candied cherry aroma with a little more fruit on the palette, then the standard dirt and smooth, long finish.